Dengue is one of the vector-borne viral infections commonly found in the tropics. 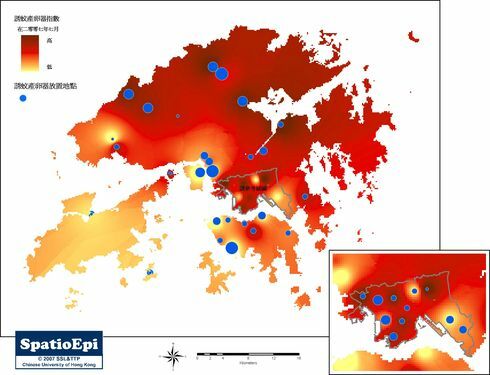 As a city located in sub-tropical region, Hong Kong rarely has locally acquired dengue cases. 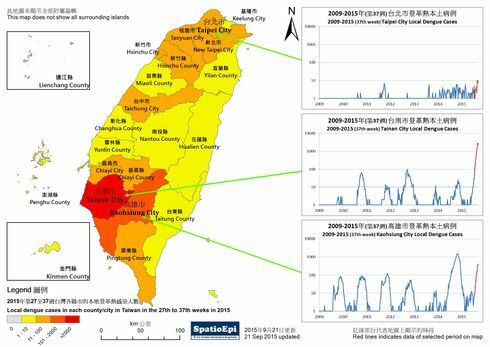 However, Hong Kong is not free from risk of dengue outbreaks because of the presence of the vector, Aedes albopictus, and continuous dengue transmission in neighbouring countries. 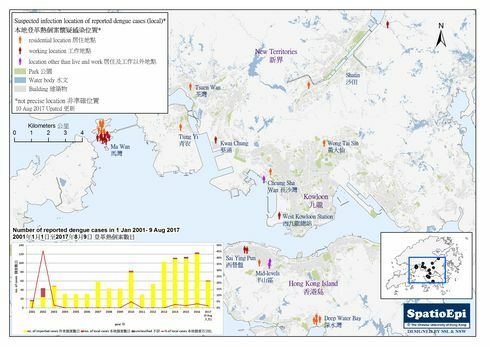 The map shows the risk of dengue transmission in Southeast Asia and the origins of imported dengue cases in Hong Kong. 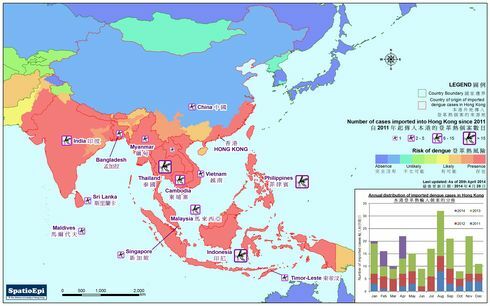 As depicted by graduated colours, dengue is prevalent in most Southeast Asian countries. Since 2011, there have been 203 imported cases in Hong Kong, almost all of which were imported from Southeast Asia. 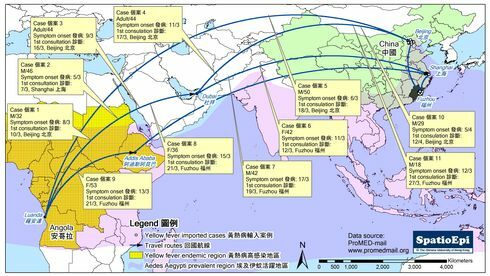 The mosquito symbols indicate that the Philippines, Thailand and Indonesia are the major sites of infection of dengue cases imported into Hong Kong. 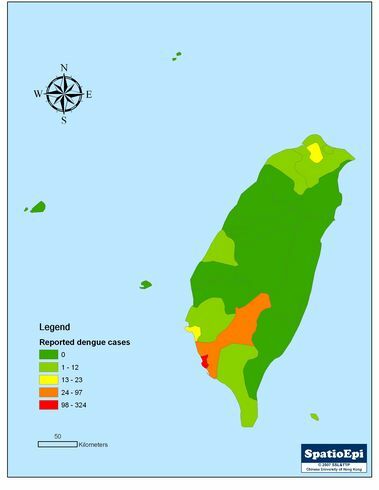 All cases had travel history in dengue endemic countries during incubation period, which explains why reported numbers peaked during summer vacation in August. 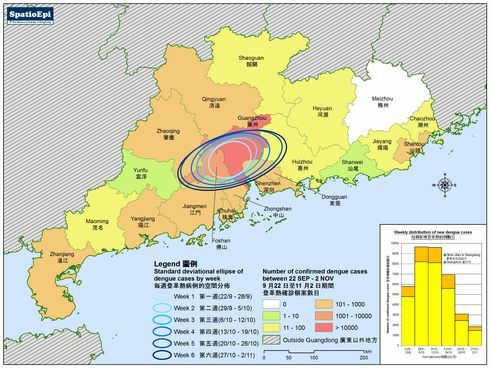 Data for the map were obtained from reports of Centre for Health Protection, Department of Health, Hong Kong and published scientific literature. Brady Oj, et al. 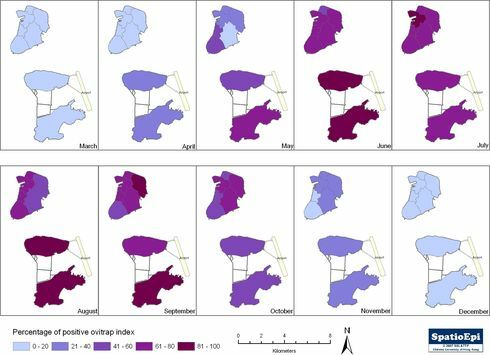 Refining the Global Spatial Limits of Dengue Virus Transmission by Evidence-Based Consensus. PLoS Negl Trop Dis 2012;6(8):e1760.